Sana’a – Today (22/08), IOM, the UN Migration Agency in the Republic of Yemen announces the publication of a Displacement Tracking Matrix (DTM) report on Enhancing the Understanding of Migration and Population Mobility in Yemen. The report identifies a total of 50,529 migrants having entered Yemen between January and July 2017. This figure is now expected to be higher. IOM’s Displacement Tracking Matrix was launched in Yemen in April 2015 in an effort to better inform the humanitarian community about the location and needs of the displaced populations in the country. By the end of 2016, IOM Yemen began implementing flow monitoring assessments as part of DTM activities in order to monitor the human mobility of other country nationals in Yemen. Laurent De Boeck, IOM Yemen Chief of Mission stressed, "It is absolutely necessary for all actors to come together to assess migratory routes, respond to root causes and to identify ways to combat trafficking and smuggling networks which set out to exploit vulnerable individuals." 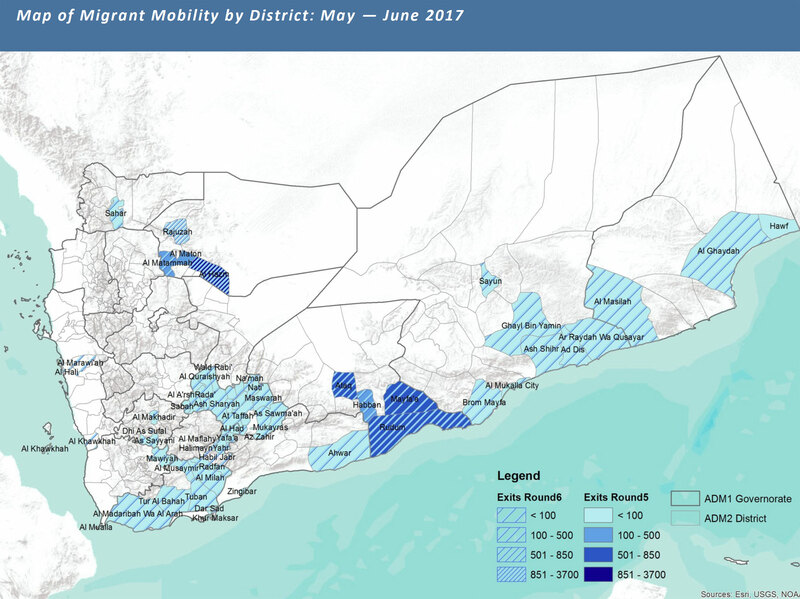 The Flow Monitoring report details the mobility through Yemen from data collected in May and June 2017. In May 2017, the IOM DTM identified a total of 31,885 migrants. This number increased to 32,552 individuals in June 2017. However, IOM has observed that the total number of identified migrants per month has decreased since March when 35,293 individuals were recorded. Somali and Ethiopian nationals make the majority of the identified mobile population in Yemen since the first pilot assessment in January. The Al Jawf and Lahj governorates were found to host the largest number of migrants in May and June. 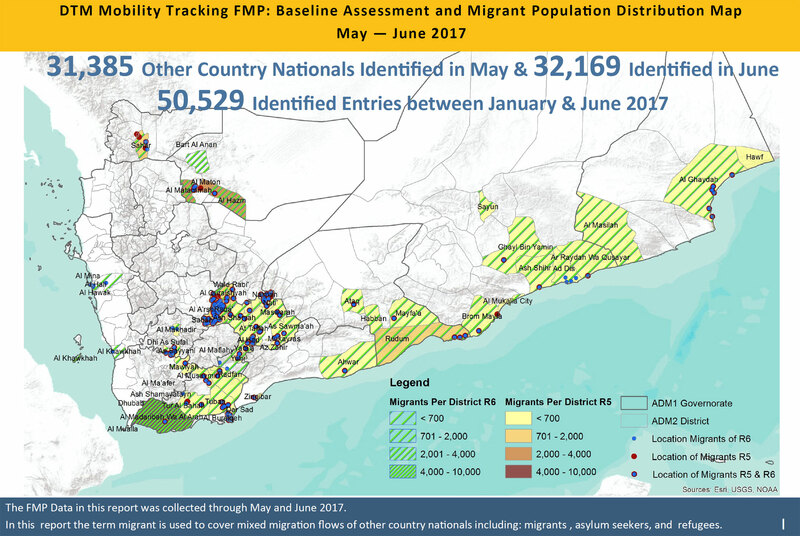 Al Bayda, Al Jawf and Lahj have hosted the largest migrant populations since the pilot rounds of data collection in January and February 2017. The majority of these migrants are male, a consistent trend since the pilot assessments were carried out. DTM flow monitoring tracks trends in migrant mobility into, out of, and within a country or region. Enumerators are deployed to pre-identified entry, exit and transit locations (Flow Monitoring Points, FMPs) where a diverse network of key informants provides information which is collected through assessments. In this context the term migrant is used to cover mixed migration flows including irregular migrants, asylum seekers and refugees. IOM will continue to expand its displacement tracking to monitor movement and the needs of people throughout the whole country. DTM will monitor internal displacements, returnees and migrants’ movements, and locations.